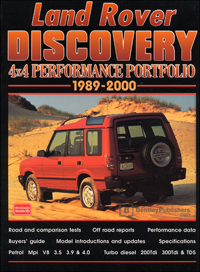 This Land Rover Discovery 4x4 Performance Portfolio: 1989-2000 is a collection of 41 original articles compiled from the pages of Autocar, Car-South Africa, Car Australia, Car and Driver, Diesel Car, 4 Wheeler, 4x4, International Off-Roader, Modern Motor, Motor Trend, Overlander, Road & Track, and What Car?. The information collected in these reprinted articles includeds 12 on & off-road tests, plus specifications , touring and long-term reports. There are three distinct phases of the Discovery. The first (1989-1994) were characterised by square headlights and, in diesel form, the 200 Tdi engine. The second (1994-1998) had rectangular lights and, in diesel form, the 300Tdi engine. Since 1998 there has been a redesigned Series II vehicle which can be had with the Td5 diesel engine. The V8 petrol engine has been available since the beginning and has gone through various guises and between 1992 and 1996 there was a 4-cylinder petrol option though this was never a strong seller. The most popular models have always been the diesels. The diesel has also made the Discovery into an offroader's delight. This is a book of contemporary road and comparison tests, technical data and specifications, new model introductions, long-term tests, driver's impressions, and contains a buyer's guide for those looking for a used example.